I read one last Christmas book to finish up the season. I actually read most of this book waiting at the dentist office, which was a very good time to have something to laugh about! Christmas Letters is a true romantic comedy. “So, this Christmas will be a different kind of experience for us, one that focuses on family, not fantasy. After reading this letter, when we meet K.O., we easily understand her aversion to Dr. Wynn Jeffries and his philosophies, which she feels have turned her twin nieces into holy terrors. Maybe she’s a little over the top in her reaction. Perhaps she shouldn’t have ranted at a customer buying Dr. Jeffries bestseller and gotten herself banned from a local bookstore. But we do understand her hesitation when she learns Dr. Jeffries lives in her building, and her sister wants her to get his autograph. She decides to do it, but then give him a piece of her mind. Then her best friend, who has been taking a class to develop her psychic powers, sees Katherine’s future in the kitty litter. LaVonne believes that K.O. and Wynn Jeffries are made for each other. She finds a way to set them up that they can’t refuse. It all adds up to silly, heartwarming fun. Perfect for holiday or after-the-holiday being cheered up at the dentist’s, for example. 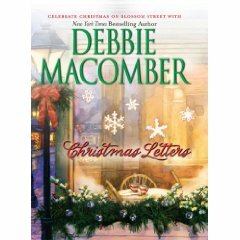 This book is set on Blossom Street in Seattle, but we only see in passing the characters from Debbie Macomber’s other Blossom Street books (at least the ones I’ve read). Still, it’s fun to be in the same setting, feeling like you’re among friends. A cozy, feel-good, lighthearted Christmas romance. This entry was posted on Tuesday, January 6th, 2009 at 11:44 pm and is filed under Christmas, Fiction Review, Romance. You can follow any responses to this entry through the RSS 2.0 feed. You can leave a response, or trackback from your own site.